The Activity Report provides statistics on what proportion of your working hours are spent checked-in to jobs in ServiceM8. 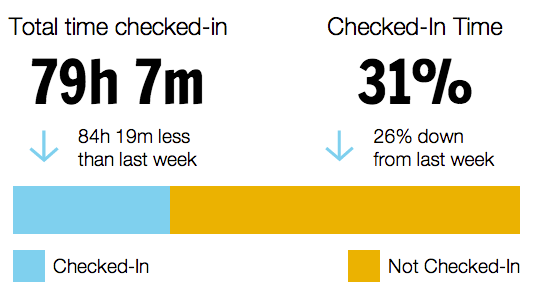 It also compares these statistics to the previous day/week, so you can see if you're increasing your percentage of time checked-in. The Activity Report can be generated for an individual staff member, or an aggregate report can be generated for your whole business. The report shows the total time checked in, calculates this time as a percentage of the total working hours for the reporting period, and shows how these numbers have changed since the last reporting period. How are the percentages calculated? Checked-In time percentage is calculated by dividing the total hours checked-in by the total working staff-hours for the reporting period. These total working staff-hours are based on your company operating hours, configured in Settings > Preferences > Company Information. For example, consider a fictional business operated by John, a sole trader. His operating hours are 9:00 AM - 5:00 PM Monday - Friday (40 hours total). If John checks in for 4 hours each day, his total checked-in hours would be 20 which would result in 50% checked-in time. If John hires a second staff member who also checks in for 4 hours each day, the business's total checked-in hours would increase from 20 to 40, but the checked-in time percentage would still be 50%, because the total working staff-hours for the business have also increased from 40 to 80 (40/(40*2)=50%). Note that if a staff member does not check in at all during the reporting period (common for admin/office staff), their working hours will not contribute to the total working staff-hours. So if John hires a third staff member who only works in the office and doesn't check-in to any jobs, the overall checked-in time percentage will not change because the office-only employee's working hours will not be included when calculating the checked-in percentage. Finally, if a staff member uses the clock-on and clock-off functions in the ServiceM8 app, these recorded times will be used instead of the company operating hours to calculate the checked-in percentage. What settings are available for the Activity Report? Settings for the Activity Report are configured in Settings > Preferences > Reports. The Activity Report is always generated once per week. You can configure the day and time at which this weekly report is posted to your Activity Feed, using the Day of Week and Time of Day settings. You can also choose whether to post individual reports, team reports, or both. Individual reports are posted only to the staff member for which the report was generated. Team reports can be posted to Business Owners only, or to everyone in the business. How do I generate Reports? What is the advanced reporting pack?